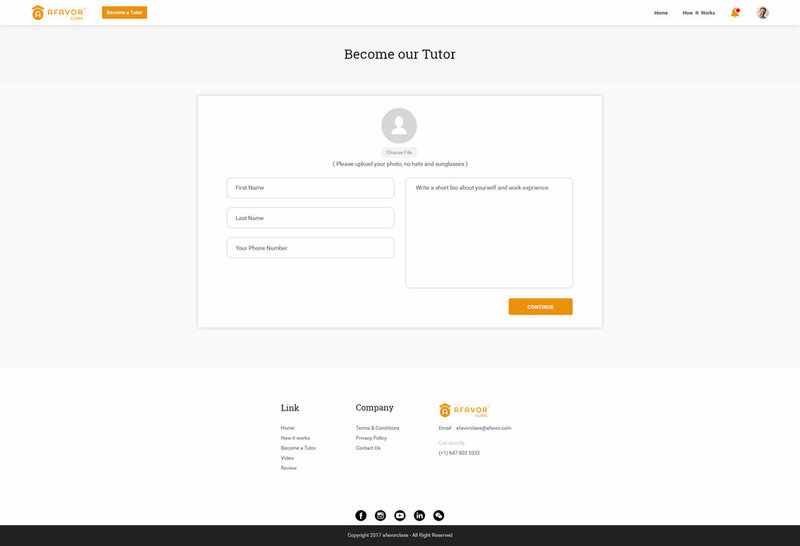 AFAVOR Class that allows users to search for classes posted by tutors, and become a tutor to both help other students and make extra money on their spare time. Being a student is tough. Between writing exams and studying for those exams, getting that “A” you want can feel impossible. That’s why AFAVOR Class can help – the secret weapon that helps you get tutoring from your peers. Learn directly from your peers or classmates, interactive classes help you learn better. AFAVOR Class provides students with personalized on-demand tutoring service not only for midterm and final review, but also for quizzes, essays and assignments. We all need a helping hand sometimes, and while one student is better at math, another might be better in English. By working together, we can achieve so much more. Get the grades you need to succeed – with AFAVOR Class. All you have to do is search the class you want to take, and once you provide your description, location, and budget, AFAVOR Class will find the best tutors suited to your needs. You can browse the list and choose your favourite, based on ratings and reviews. Tutors love AFAVOR Class too, seeing as they can earn money by providing academic support.